December’s volunteers stand tall with Dottie Campbell and two of the three new directors of the Community Food Pantry, Joyce Dennis and Rev. Mark Phillips. Volunteers praised Campbell’s smile, warmth and passion while presenting her with a commemorative plaque. “She has devoted her life to this,” said volunteer Rita Hollada. Campbull has put in countless hours year-round, besides the monthly distribution — a well-oiled machine giving everyone personal attention, while keeping the line moving. There’s the collections, the shopping, the paperwork, the registrations and advice to other groups trying to kickstart their own food pantries. During the month and in summertime, Campbell also coordinates emergency food distributions to families who can’t wait for the next scheduled pickup. It will literally take three people to replace her: Dennis, Myra Bare and the Rev. Mark Phillips. Campbell will still help behind the scenes, taking phone calls and assisting with paperwork. “Things will continue in her standard; it’s just going to take more of us to fill her shoes!” said Dennis. Campbell and her husband initially tagged along when their school-age daughter needed community-service hours for church. When the pantry desperately needed a new coordinator, Campbell said jokingly, that she “was volunteered” for the position. But she carried the mantle for the next 20 years, even after her husband, Glen, passed away in 2014. “I started in 1996, and I took over directing it in ’98, so it’s over 20 years … Physically, it’s getting more and more difficult,” Campbell said. This December, CFP served the typical average of 70 families, but numbers vary. After the economic downturn of 2008, the pantry served up to 170 families in one month. “We saw a need in this area to help the less fortunate,” Campbell said. “I never call them ‘needy,’ or other words people use. Some have hit a bump in the road, and it’s temporary. Others are seniors, handicapped, and they’re long-term” [clients]. Parents might need help in between jobs. In winter, young people with lucrative summertime jobs might lose hours but have high heating bills. Pay cuts during the 2008 economic downturn definitely impacted people, Campbell said. The Community Food Pantry distributes food at Salem United Methodist Church on Church Street in Selbyville. The pantry opens for pickups from 9 to 10 a.m. on the third Saturday of each month from September to May but can provide emergency groceries in summer. Anyone else needing some extra support is welcome at the food pantry, from small or large households. Each family receives two full bags containing the essentials; one grab bag of “extras”; and fresh donated meat, such as Mountaire chicken, or ground venison from local hunters, through the Division of Fish & Wildlife’s Sportsmen Against Hunger program. To receive food, first-timers should call beforehand, but they can also show up Saturday morning by 8:30 a.m. with a photo ID to fill out an application. They must live locally, in southeast Sussex County, from Selbyville to Dagsboro, eastward to Bethany Beach and Fenwick Island, and all areas in between. If they are able, families are asked to give a $3 donation. Campbell answers phones with a friendly voice, knowing first-time clients can feel embarrassed. The program began when Sussex County churches partnered together to address hunger in the community. Private donations and food drives support the Community Food Pantry. Volunteers and student groups get the work done. Since Campbell lives near Fenwick Island, she also praised Victor Murray, who for years lived close enough to open the church for emergency needs. 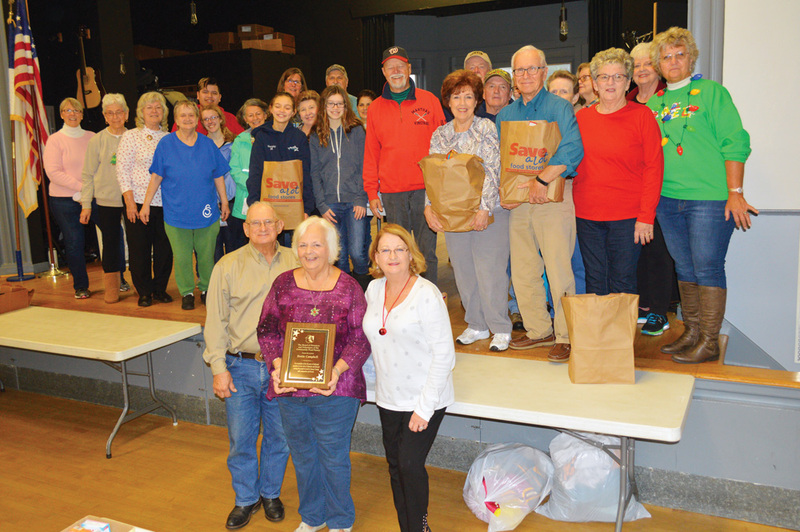 She also thanked the Assembly of God Church and Salem UMC for housing the food pantry for 12 years and 14 years, respectively. Volunteers are welcome to help sort food and load bags. Adults should arrive at 8 a.m. to sort food, and youth can come at 8:45 a.m. to carry bags. For details on receiving food, volunteering or making donations, contact Joyce Dennis at (302) 732-6565 or Mark Phillips at (302) 381-9312.